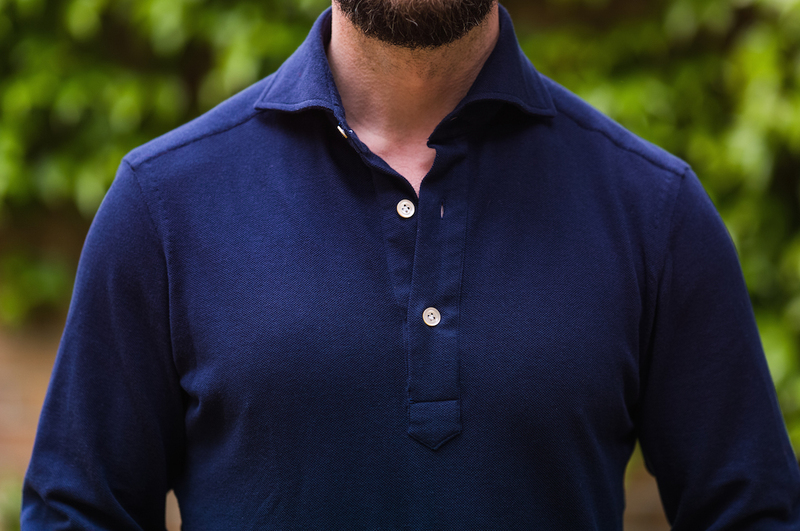 Over the past few months I’ve been working with shirtmarker Luca Avitabile and Caccioppoli on a range of ready-to-wear long-sleeved polo shirts. We’ve now completed work on them and they will go into full production in September. However, I have 50 final, perfected samples available now if readers would like to get a jump on everybody else. 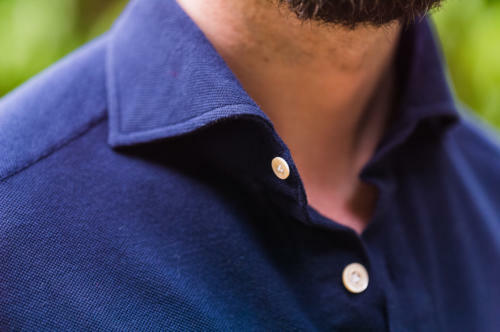 The polos are available across five colours, four sizes and two styles (buttoning halfway, and buttoning all the way through like a shirt). As a result, there are only 1-3 available in each combination. So get in now if you have a particular size and colour you want. 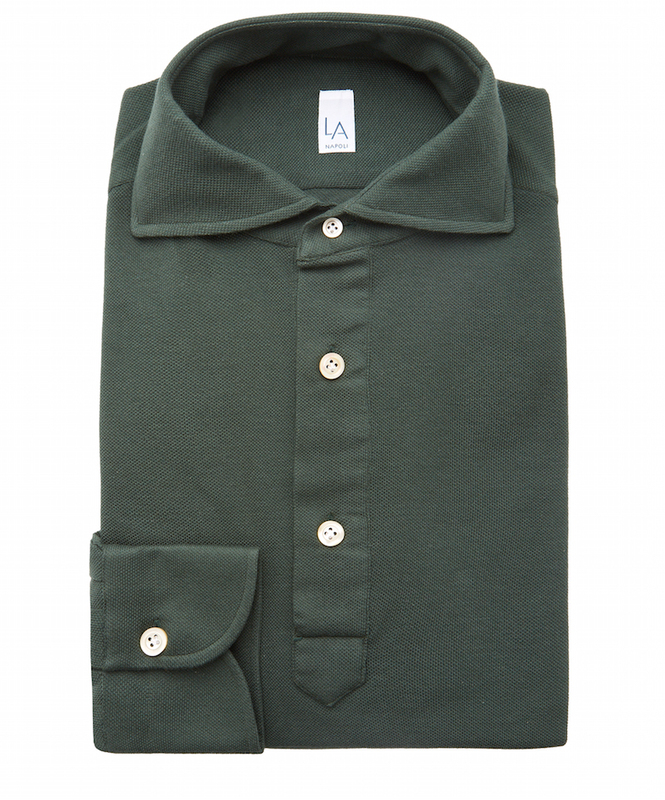 We have no smalls in the button-through style, but otherwise all sizes have at least one available. I’ll post an update at the top of this post when different styles, colours and sizes sell out. You can see the five colours here: white, navy, grey, blue and racing green. My particular favourites are the navy, as worn above, and racing green – which is just the right shade for a navy jacket. The mother-of-pearl buttons also look really nice against the white. You can follow the discussion on The Friday Polo – limited availabilty now by entering your email address in the box below. You will then receive an email every time a new comment is added. These will also contain a link to a page where you can stop the alerts, and remove all of your related data from the site. Hi Simon…..interesting concept, is the fit through the body similar to that of your Smedley collaboration? Not quite as slim, but still slimmer than most polos. When you say ‘body’ length from where is this measured to where? When they are released in September through whom will they be sold? 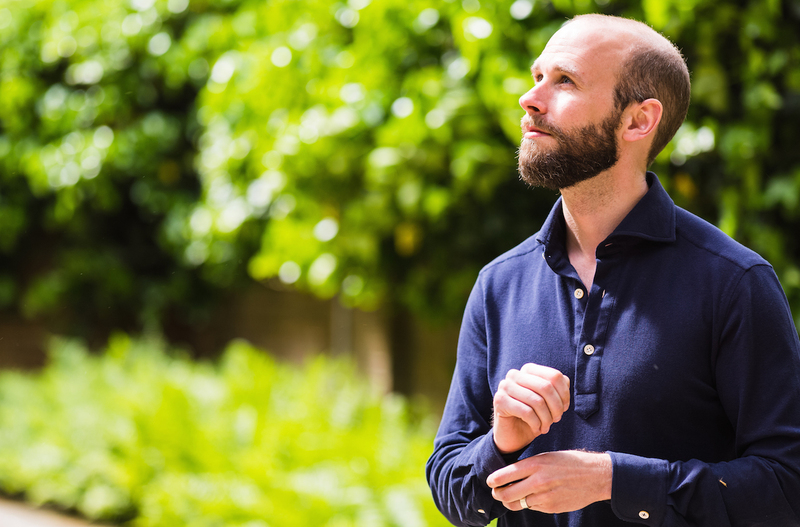 I cannot work out the sleeve length – for example i am a 33″ yet none of the measurements given match. I am correct is saying a sleeve is measure from the centre of the yolk just below the collar? If the sleeves are too long (often the problem for me) do you think they can be altered as most tailors say not for this type of fabric? Body length is from the bottom of the collar on the back to the hem. 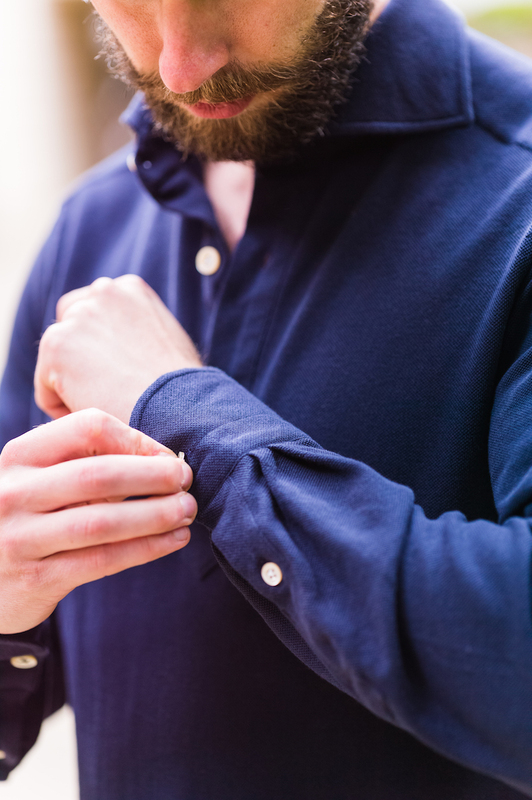 Sleeve length is from the shoulder seam to the end of the cuff, along the top of the sleeve. Length might be a concern for you, yes. Very nice looking polos. Reminds me slightly of the polos that The Armoury sells from Ascot Chang. The green is beautiful but unfortunately sold out already. Will the pricing/colour choices stay the same when released in Sept? The colours are all still available in button-through style, in case that’s helpful. Looks great Simon – looking forward to the September run given the scarcity of greens now. Just to help me judge sleeve length of these against the pics – what is your usual shirt sleeve length? I have a similar body size but perhaps slightly longer arms as I usually go for 36.5″ on the sleeve. Yes I’m normally around 36 or just under. Thanks Simon, one last question – is the material such that the sleeves could be stretched a little after washing, just in case they come out slightly short? Some time ago you mentioned that you were working in collabaration with Begg to produce neckerchiefs and i was wondering how this was coming along as the autumn time is approaching. The reason i ask is that at the weekend i watched Edward and Mrs Simpson – the old 1978 version and the clothes are just stunning on Edward (he also uses neckerchiefs hence me remembering). If you have not seen this i would highly recommend that you do (see link below). The combinations of shirt cloth and ties is bold and one would think not possible but they are a triumph. The suits are beautifully cut although perhaps the lapels are too large. The thing i liked too was that their suits are never undone when sitting down which looks very smart and chic. The casual clothing, of which there is a great deal too, is simply sublime. Shawl neck cardigans, knitted tops galore, dressing gowns and much, much more. I am sure this would provide you with much entertainment that is, if you have not already seen it. Anyway, the neckerchiefs are quite bulky and the key thing – long. I say key beacause they keep popping out if they are not long enough but not too long that they are bulky! A comprehensive post on this article of clothing and how to tie the elusive knot would be very much welcomed. Interesting that nearly all the half way buttoned have gone. What are your views on normal shirts (cotton) with a half placket for casual wear? (Rather like cricket shirts many years ago). Are these going to be sold again? If so, when are they coming back? 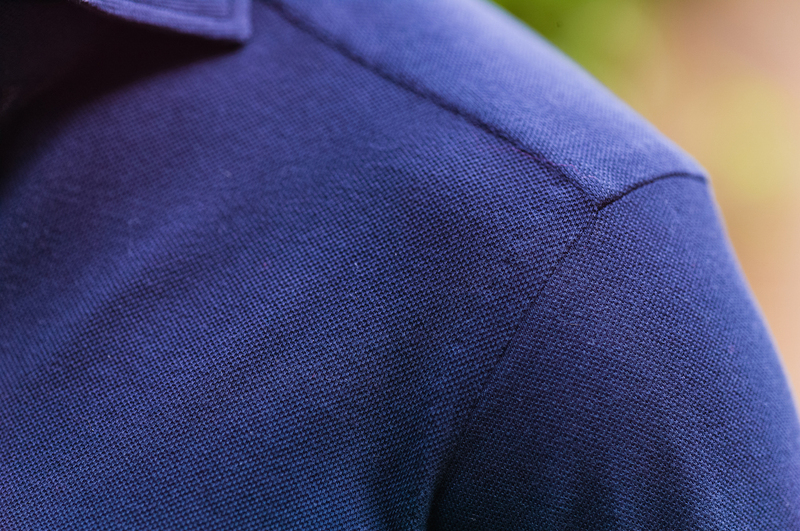 Are the grey polo in M (half-buttoned) and the Navy polo (full) still available? Thanks. Fantastic ingenuity in creating a piece that can be worn by those in less sartorially demanding roles! 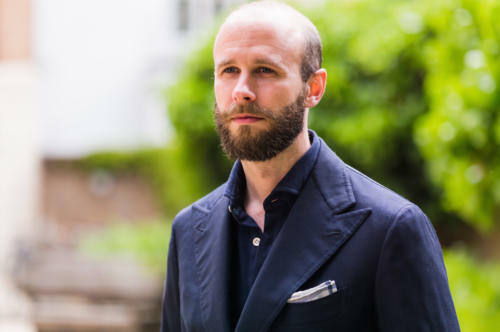 Just out of interest, do you think it would be possible to create a piece like this, with shirt styling & structure such as the strong collar band/button through, in a similarly less formal cotton to be worn with a tie? 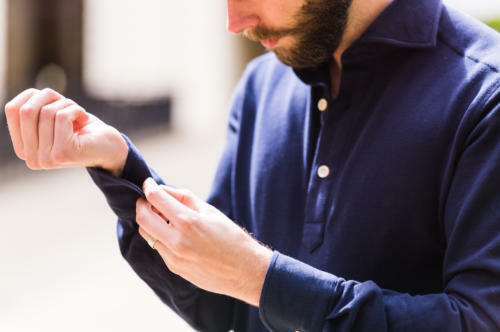 As I am a student who wears uniform and the standard of dress is unsurprisingly low, I am interested in experimenting with my shirt maker for more interesting versions on formal wear (and maybe a little to prove to my peers that one can be sartorial, while still being comfortable). I assume the resulting piece would be incredibly comfortable to wear and would negate the need to wear an undershirt due to its thickness. Any thoughts would be greatly appreciated! Thank you.